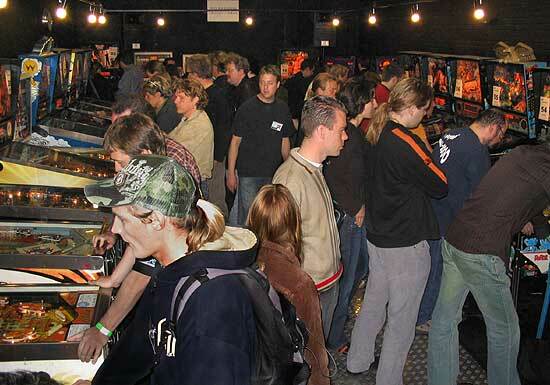 Normally around this time of year we would be reporting from the Dutch Pinball Open in Leusden. 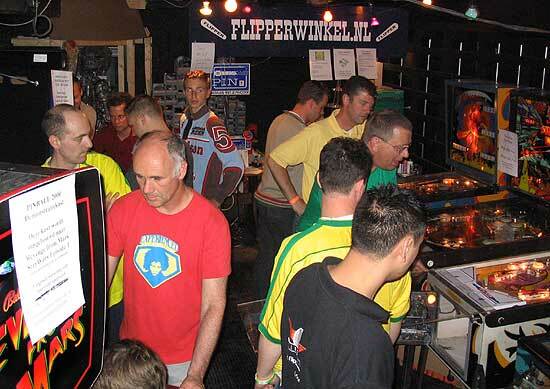 But this year things have changed because the Dutch Pinball Association (NFV) have revived the European Pinball Championships. 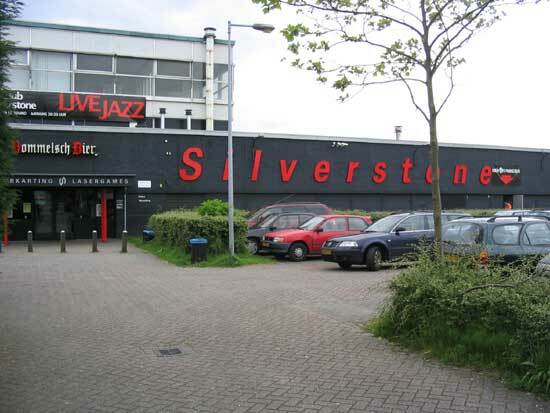 Last seen in 1997, the reborn EPC was held at the Silverstone centre on an industrial estate in Zwanenburg - a quiet, pleasant town on the western outskirts of Amsterdam. The Silverstone building is home to a large indoor kart racing circuit which takes up most of the interior. The remainder is divided between a number of games rooms and a central bar area. 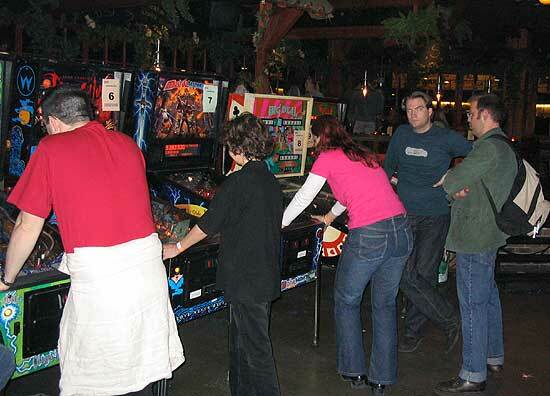 This weekend however, all the games areas were taken over by the EPC pinball machines and vendors. This was the view as you entered Silverstone. The bar served drinks and snacks such as fries, rolls and toasties but rather than take cash, you had to pay using vouchers purchased from a kiosk on the left for €2 each. 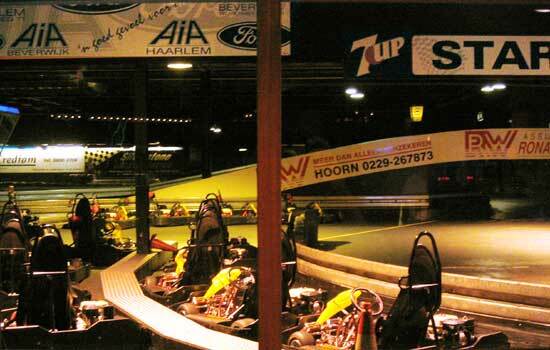 Prices were reasonable with a daily special offer on food for a single voucher and there was plenty of seating both at the bar, on adjacent tables and on a raised area overlooking the karting track. Small groups of games were set up all around the edges of the bar area. The first of these was in a semi-enclosed room to the left and was used for the country and the classic tournaments. Behind this room was another small room with parts for sale and five games to play. Meanwhile, just outside the tournament floor was another group of five machines. Across the other side of the bar were two more set of games. All the various groupings of machines comprised a mix of modern dot matrix and earlier solid state games with the occasional electromechanical thrown in for good measure. The actual games in each group changed across the weekend as machines were swapped out for use in the tournaments. 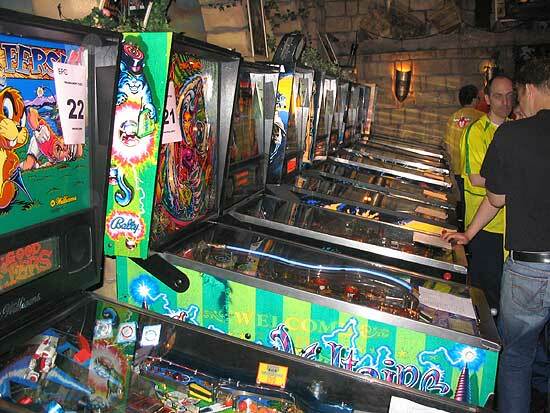 To access the other games, a stroll through a tunnel to the right of the picture above was needed which brought you to a room with another 23 machines set up. This room is the one that is regularly used for pinball games even when the EPC hasn't taken over as you can see in our earlier report on Silverstone. For the EPC however, they had removed the centre tables. Even deeper inside the complex was another room with still more games. 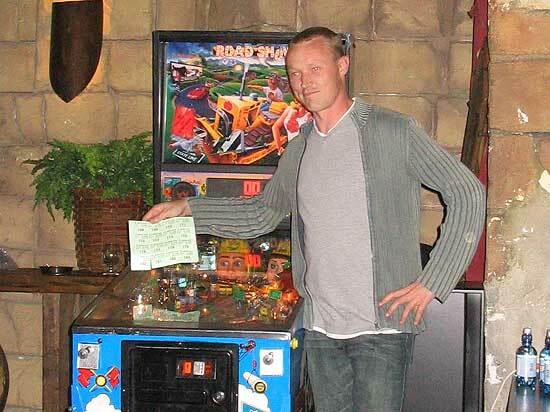 The Revenge From Mars in the picture above was used for a demonstration of the Pinball 2000 system at various time through the day. As you can see, the games were spread out across a number of small rooms which became quite crowded at times. The layout required some walking around and made it difficult to see which games were free. There were a number of parts vendors scattered around the show including Pinball Wizard, Flipperwinkel, Karin Kolbe and the NFV's own stand. Pinball Wizard were also showing the new Whitewater mountains and Boulder Garden bumper caps from Illinois Pinball. 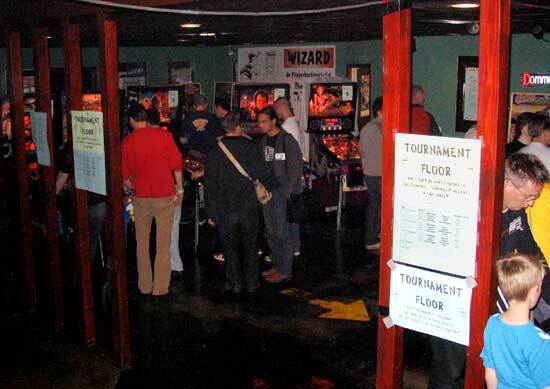 The final room housed the largest collection of games which were reserved for the individual tournament. Twenty eight games were set up in this medieval style hall. They were all modern dot matrix games with the single exception of a Data East Secret Service. * these games were not working when the list was compiled. There were three tournaments taking place across the weekend - Country, Classic and Individual. 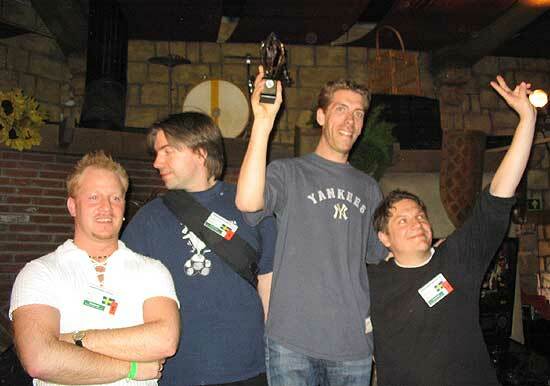 The country tournament saw teams of four players from eight European countries competing for the title of European Team Champions. They were: The Netherlands, Germany, France, Belgium, Spain, Sweden, Switzerland and the United Kingdom. Many of the countries had made an extra effort and wore team t-shirts for the event. The teams were divided up into two groups of four (A & B) and each team played matches against each of the other three teams in their group. Each match consisted of a two player, four ball game where each team member played one ball. The team with the highest score earned five match points. After that, two members from each team played a four player game against two members from the opposing team. The remaining two players did the same on a different game. The winner from each of these game won nine match points, second place got five, third place earned two points and last place scored no points. All these match points were totaled to produce a winning team who scored 2 championship points. The teams then played another in their group and so on until each team had played their three opponents. The two top teams from each group progressed to the semi-finals where the winner of group A will played the runner-up of group B and vice-versa. All the teams chose two machines to play their match on. 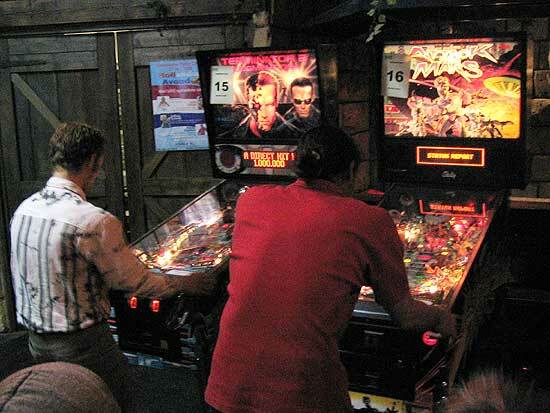 On each of the four chosen machines, one single four-player game was played. The total score was determined by adding up all the points gathered by the team members during the four games. That left just two teams - Sweden and Spain to battle it out in the final which was played to the same rules as the semi-final. Sweden came out victorious winning the EPC Country Challenge Cup, a golden pinball statue, EPC t-shirts, caps and key rings for all 4 players. That left Spain in second place and The Netherlands in third ahead of Belgium. 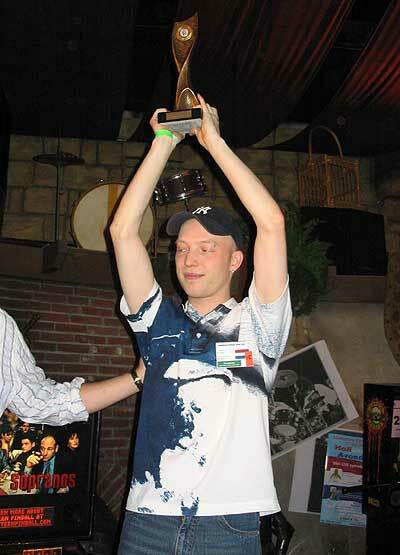 The Classic tournament took place on a mixture of electromechanical and early solid state games and was won by Per Holknekt from Sweden. 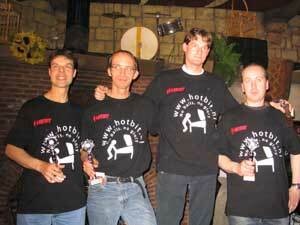 But the big one was the individual tournament for the title of European Champion. 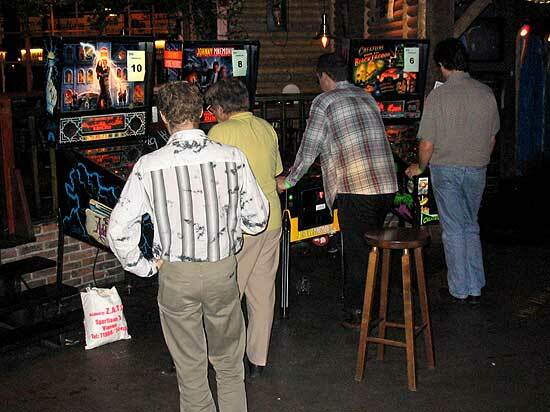 There was a large number of entries for this, so they were pared down in a number of qualifying rounds, the first of which involved playing five four-player games on random machines. Unlike in the Country tournament, this wasn't all about whether you won your game. Instead, it was your score that mattered and would be compared to other players of the same game to give you points towards qualifying. The points for the top players in each game were awarded in the order 25, 23, 21, 19, 17, 15, 14, 13, 12, 11, 10, 9, 8, 7, 6, 5, 4, 3, 2 and 1. After all five games were played, the points were calculated and added up for each player, and the top thirty-two went through to the next round. They were joined by an extra sixteen players from the four teams knocked out in the first round of the Country tournament. These forty-eight were split into twelve groups of four players who played a further four games on random machines. Again, it was the scores that mattered so that by the end of Saturday night there were forty-eight of the top players in Europe (including the Country tournament semi-finalists) who would proceed to Sunday's final rounds. The first round on Sunday was twelve four-player games where the first and second placed players (24 in total) on each game proceeded to the next main round. The third and fourth placed players (another 24) went into the first bonus round where they could play against each other for the chance to get back into the main competition. Both groups of twenty four then played eight three-player games with the top two of each game again going through and the third placed players in the main round entering the second bonus round, filling in the space that was left by the 8 third-placed players losing that game over there. The remaining sixteen played four four-player games. 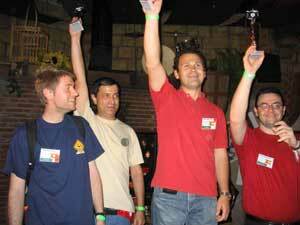 The best two players in the main round went into the final round, the others joining the bonus round (the remaining 24 players over there having played eight three-player games, of which only the winner continued), where eight two-player games were played, the winners of which returned to the Finals round. The remaining 16 players went to the Finals round. 4 games of 2 of which the winner went to the big final. 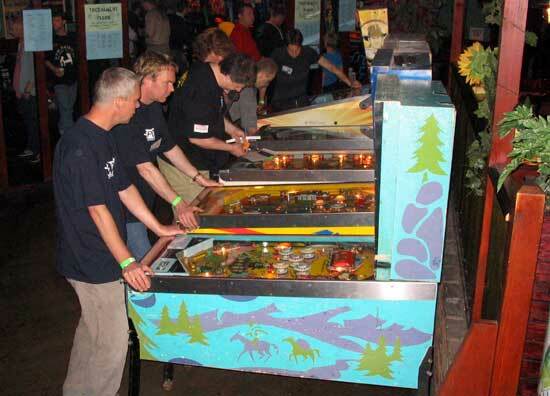 All games were organised in such a way that no player would never play the same machine twice. So after all those different rounds only the best, most consistent players make it through to the final four. 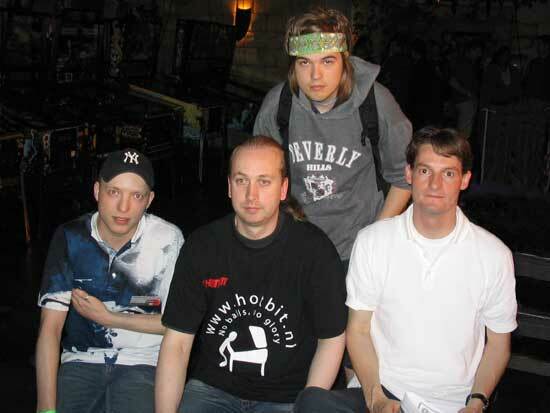 They were Dirk Klaver, Paul Jongma, Linus Jorenbo and Roy Wils - three Dutch players and one Swede. 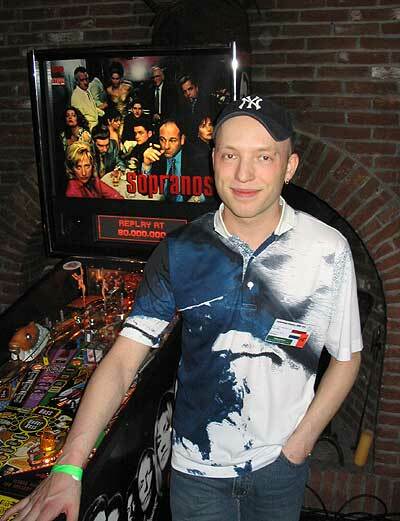 The final was a single five-ball game on Stern's latest game - The Sopranos. 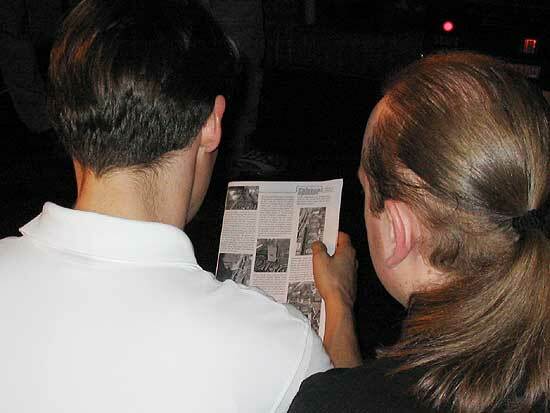 The game is still not very common in Europe so for the finalists there was some last minute checking of the rules from this Dutch translation of our Pinball News review in the NFV's Spinner magazine. The Dutch organisers have always been very good at making the final the spectacle it should be with a video projector showing the game table and scores for the spectators. There was also a camera crew there from the TV station to cover the final. During the qualifying rounds there were several crews going around taping the events and interviewing the contestants. As the final game got underway Linus had a good first ball and it looked as though it would be a solid foundation on which to build a win. Indeed, many people in the crowd thought it was only a three ball game so cheered wildly when he had the lead after the third ball. 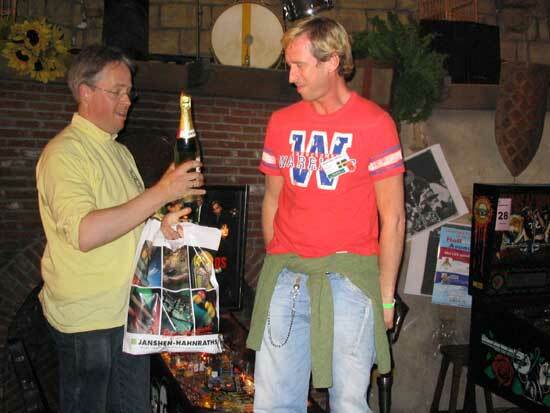 But this was a five ball game and after a number of solid scores, it was Roy Wils from Nijmegen in The Netherlands who triumphed with 61,196,950 to Linus's 51,449,410 and became the new European Champion. By winning the EPC, Roy took away the EPC Challenge Cup, a golden pinball statue, an EPC T-shirt, cap, key ring and cup but most importantly he won a trip to play in the PAPA8 tournament in Pittsburgh, USA in August. Roy was given his winning trophy by the previous European Champion - Frenchman Franck Bona. 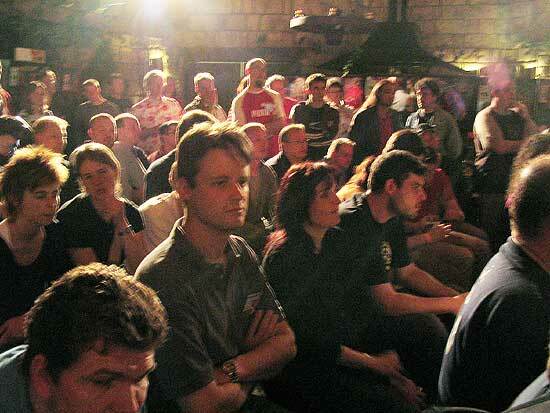 After the various prizes had been awarded, the raffle took place with ten prizes of increasing value including parts vouchers, key rings, mugs, posters, pinball Christmas cards, video tapes, computer games translites and culminating in the major prize of a Road Show pinball machine for one lucky winner. 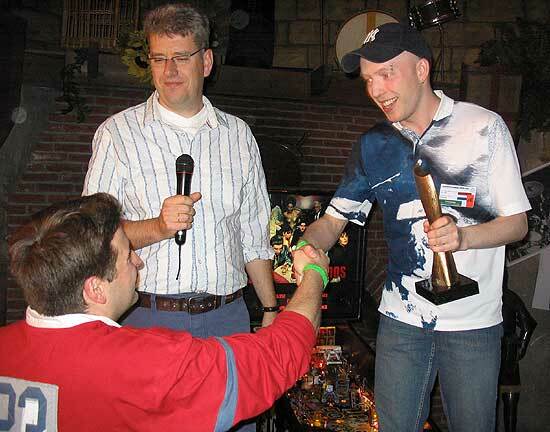 And so concluded the first European Pinball Championship for more than seven years. 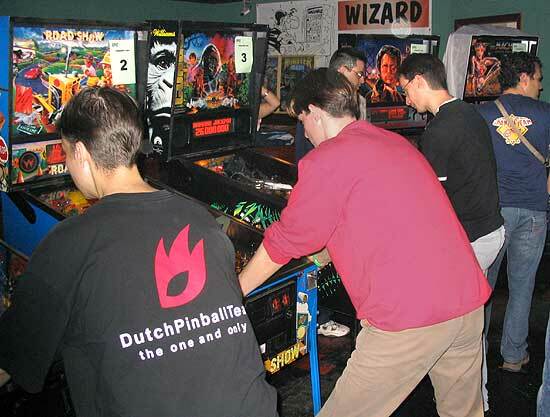 There can be no doubt that the extra international element attracted a higher standard of players and more of them than you would find at the regular Dutch Pinball Open. But the intense competition did not turn into unfriendly behaviour and everyone taking part should be congratulated for their positive and helpful attitudes towards fellow players. The tournaments worked well but the rules were initially a little overwhelming with a mixture of one, two or three players going through to the next round in some cases and the points scored deciding your progress in others making it tricky to know if you're doing well or not. Clearly it's not easy to manage so many competitors, especially when some of them are playing in a parallel tournament so we can forgive some complexity if it produces a set of rules that work. The Silverstone building is a curiosity and while it works well on many levels, by spreading the games across so many disparate rooms the number of games available looks fewer than it really is. The location is good in that it's very close to Amsterdam but being in the middle of an industrial estate means there are no shops, cafes or restaurants as close by as they were in Leusden. On the plus side, Silverstone does offer some good facilities itself, so the need to wander outside is reduced. So congratulations must go to the NFV organisers of which there are many, since the whole event went smoothly with very few of the problems that can plague a tournament with so many competitors. They've got the EPC ball rolling again and can now take a rest because next year it's the German Pinball Association's turn to run the EPC and it will take place in Munich. If you'd like to see more pictures from the show, you can visit the Pinside site here or Flipper Farm here.